So, prepared to shop for all the fun stuff, Stacey and I set to work making a baby shower. WHAT. A. MISSION! 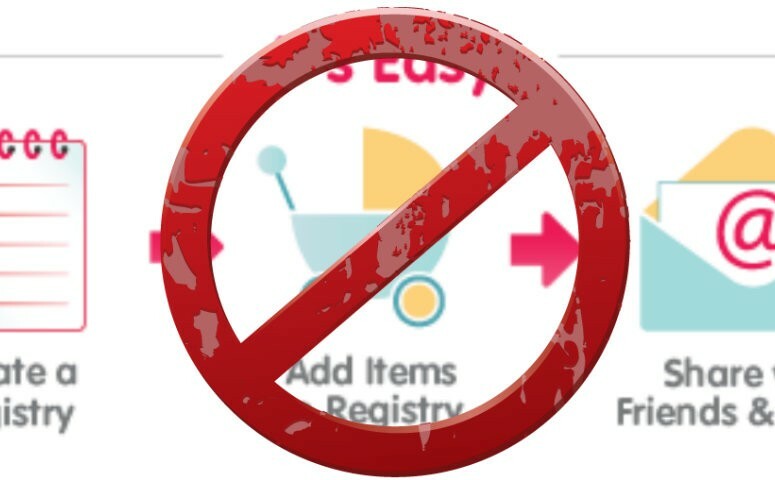 We had already ruled out Baby City because they only allow you to make a registry close to the shower date, plus none of it ends up online so you actually have to go to the specific store where the registry was done and rummage in the registry bin. Instead, we went to another major baby outlet, and then another, and then another. Almost all of them let you register, but almost none of them have sites that list all the products that they actually stock. For example, on the Babies R Us registry, i could find a manual AVENT breast pump, but not an electric one. And I could find one model of Angel Care monitor, but not the one I actually wanted. All this despite the fact that I’ve SEEN the ones I wanted in the actual stores. I guess it wasn’t meant to be. See, I shouldn’t have worried about the ethics of baby registries, but rather the logistics of them. But this is better, I think. Well, I hope. Instead of a registry, people will be given places with stuff that I like where they can feel free to buy just about anything. At the same time, my only real request for the baby shower is that everyone brings their favorite kid’s book. If people do that, they will already have shown such thought and love, and Harley will have something special from each person. If they still want to buy me something, at least then it won’t feel generic or thoughtless to get a voucher or something – the thoughtfulness quota will have already been met. it all works out for me in the end, although I’m sort of shocked at the way South African stores handle these things. Surely the people having kids these days are young and prefer to shop online. You’d think that they’d make the process streamlined, with standardized “first time parent” check lists for people to choose from when doing an online registry to make the whole process as quick and easy as possible to ensure that the stores get all the money? Now, it will just be that much easier for me to end up buying the baby stuff at non-baby stores. Silly retailers.